Another super easy meal, this one is ready in less than an hour. Boneless, skinless, chicken breasts are dipped in an egg wash, then dredged in seasoned bread crumbs. Bake at 375 degrees for about 30 minutes or until it is done, and serve with mashed potatoes and peas and corn. Ok, I think this is the last of the photobucket spring cleaning. Now we can start posting recent recipes. This is indeed easy and it’s comfort food too. I also need to clean up my food pictures. Too much backlog! At the rate I’m going, I’ll be late for my own funeral. Sus talaga! 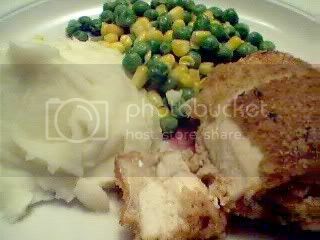 Just gazing at that photo there….as much as I love italian food and all types of ethnic dishes, that chicken and mashers are making me crazy! I can already taste it my mind!